Wear rubber-soled shoes. If you are an avid outdoor walker, consider putting ice and snow traction straps on your shoes. Avoid wearing dress shoes. If you must get dressed up on a very cold or wet winter day, bring your dress shoes with you and change at your destination. Consider using an Assistive Device- A cane, walker, or walking sticks with an icepick attachment during the winter can give you extra stability. Plan ahead. Think about the best route to your destination and add extra time to get there. Avoid rushing or taking shortcuts through the snow or over icy areas. Never leave the house without a phone. If you are going for a walk, make sure you have a way to contact someone in case you need help. Walk outdoors in good light. Turn outside lights on before you leave and make sure they are on when you return. Avoid walking outdoors around dusk or after dark. Use salt or cat litter on your driveway and sidewalks. Consider carrying a small bag with you in case you need it while you are out. Walk on the grass if the sidewalk is too icy. Take small steps on icy/snowy areas. You want to keep your center of mass over your foot and not step out of your base of support. Don’t run. Keep your hands free. Your hands and arms are very important to maintain balance. Keep your hands out of your pockets and avoid carrying anything or too much. Be careful getting into and out of the car. This is when many falls occurs. Take a quick look around to make sure your footing is clear when you step out of the car. Be aware of “black ice”. This is hard to see- stay on clean, clear pathways or ones that have been treated with sand or salt. Use floor mats. When entering buildings remove the moisture from your shoes. Once indoors, avoid walking on wet or slippery surfaces. Remove snow quickly. If possible, remove the snow from around your house as quickly as you can so it does not turn to ice. If unable to do it yourself, arrange for help- talk to a neighbor, friend, or family for assistance. Shovel Carefully. 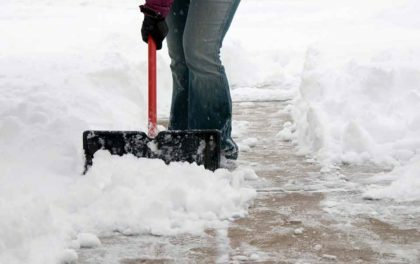 If you have to shovel, make sure you clear a level pathway to stand on, so you don’t lose your balance. Use good body mechanics and go slowly. Always use your best judgment when heading outdoors this winter and stay safe. We love our jobs and seeing our patients, but don’t want to see you this season in the therapy office or hospital rehab with a broken hip that could have been prevented!